I have been playing organized ice hockey for a few years. I grew up playing as a kid in Canada, like most other kids. 1) the fun aspect — this is a great way to truly have fun. Hockey itself is a great team sport, that is fun, exciting and pretty fast paced. 2) exercise is key — i am not one who enjoys going to the gym and pumping iron, or doing your typical work-outs. For me, the redundancy of doing something is a big factor—ie, I would rather have fun AND get exercise than just trying to do some program to keep fit. 3) competition — mostly you want to compete when you engage in a physical activity. Not saying that winning is everything—being competitive is not really about winning, it is about trying to find a place where you feel comfortable while maintaining your desire to continue. Basically, if you always win, or always lose, I think you will tend to lose interest one way or the other. But, if there is a good level of uncertainty–it spices up the activity. 4) team work and relationship building — this area is a big deal. You can be on a team for a season, but for the long haul–you really want to be on a team where you have real relationships that you value. Even with just rec hockey (or other team sports), it is sooo much better when play with people you enjoy being around and where there is a mutual respect. I was surprised to find how many ice rinks are in the Phoenix area–with new ones also being built. 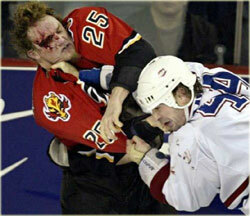 Hockey is a great sport. When you say the word *Hockey*, most people automatically think of fighting—that is a shame, because although fighting does exist, it is definitely not as widespread (especially in the rec leagues I have been involved with). I have been playing now in Phoenix for over 5 years and have probably played well over 150 games in that time—I have not been involved in 1 fight. The other day I was at the local hockey store during a week day, getting my skates sharpened, and a mom along with her young son (and grandma in tow as well), were getting the son fitted for full hockey gear. The boy was around 4 years old. This was the first time getting any hockey equipment and the boy was genuinely excited and the mom was a bit nervous not knowing what exactly to get or how to put it on. She insisted the boy put on all the equipment (of course she helped him), so she would know the proper way to get dressed for a game. She had the boy enrolled in a hockey program starting that weekend. It brought a smile to my face seeing the excitement that the boy had and the dreamy expression he showed when he held the hockey stick for the first time. Final Assessment: Hockey is an excellent sport for both young and old—and fighting in rec hockey is not as prevalent as you may think.